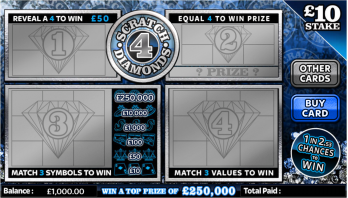 Scratch 4 Diamonds is a 4 panel scratch card with a set stake value. When the ‘in play’ interface is displayed, the ‘BUY CARD’ button becomes the ‘REVEAL’ button. Tapping the ‘REVEAL’ button reveals each of the 4 scratch areas in turn from top left to bottom right.